Chalice Chapels are worship services for children ages 6-12, held instead of Religious Exploration classes on Sundays during the week of a public school holiday or a national holiday. This year’s theme for our Chalice Chapels is Spiritual Practice. 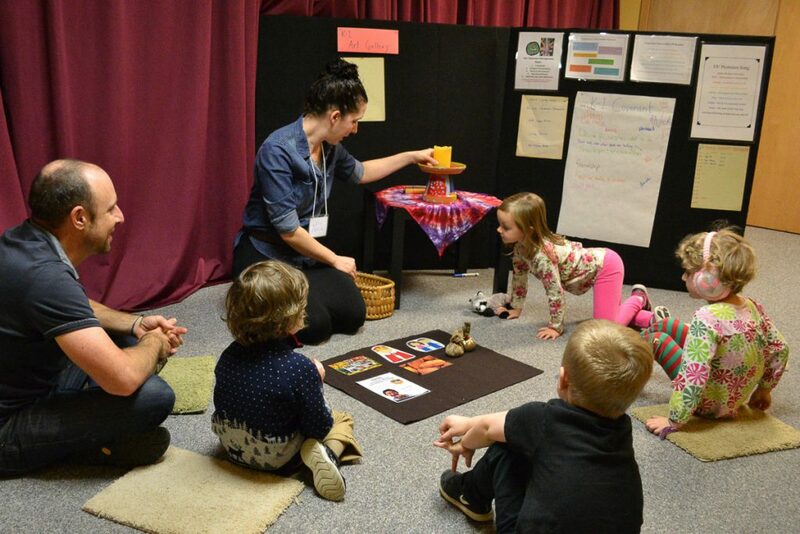 Children will be learning about the spiritual practices of: friendship, hospitality, storytelling, poetry, music, prayer, meditation, nonviolent communication, solstices and equinoxes, sacred space, time in nature and more. These classes will consist of interactive, engaging art activities, games, singing and practicing different spiritual practices. The dates for these chalice chapels will be: September 23, 2018, November 11, 18, and 25 2018; December 9 and 16, 2018; January 20, 2019; February 17, 2019; March 17, 2019; April 7, 14, and 21, 2019; May 26, 2019. Our paid caregivers warmly welcome infants and toddlers to our nursery. 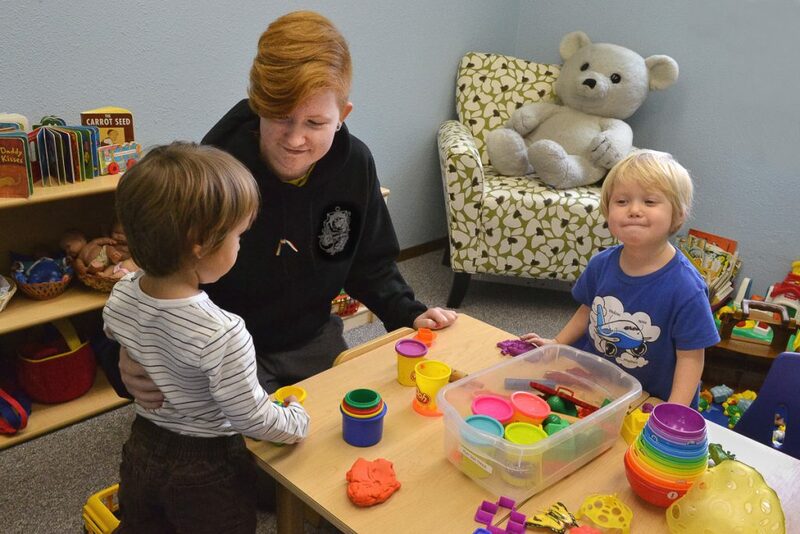 The nursery accepts children ages 6 weeks to 3 years. Children of all ages are also welcome in the service at all times. There is a quiet room in the loft of the Sanctuary for those families who want privacy. The nursery is open from 10:15 to 12:15 on Sunday mornings. 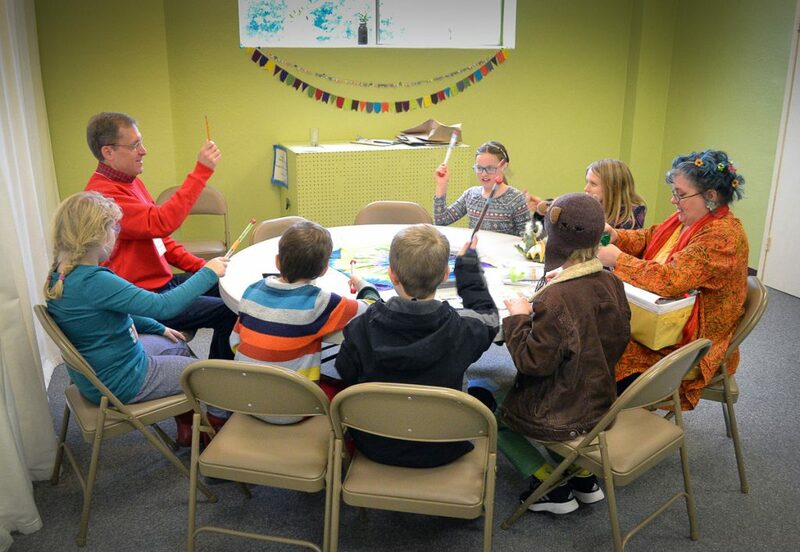 On Sundays when there is a multigenerational service offered (when all children and youth remain in the service to worship together), children up to age 4 can attend the nursery. In each session children will hear a story and then experience a time for art expression relating to that story or another story that was heard earlier in the year. The stories have a Unitarian Universalist focus and seek to build a UU identity through liturgical lessons pertaining to our central story, our covenant, our religious symbol the Flaming Chalice, our church history, and UU heroes. Many of our stories are about our Seven Principles, called Promises in this program, and our Six Sources. Others are about the mystery that some people call God. 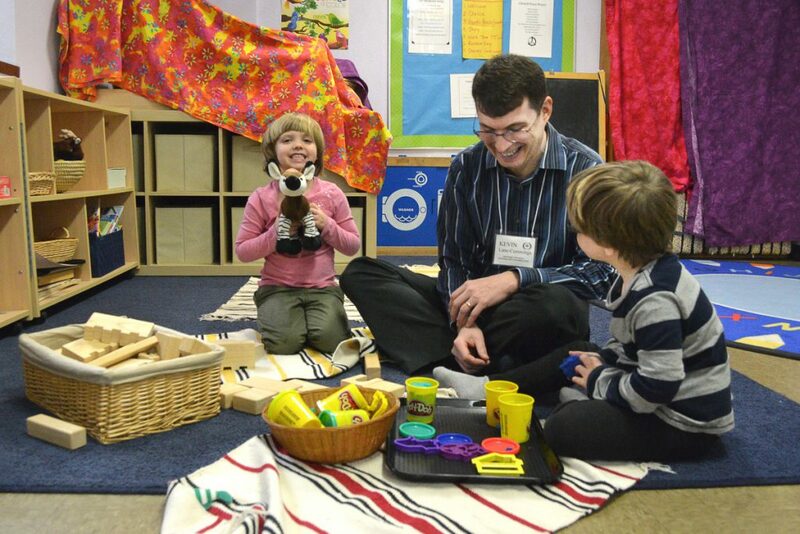 Children are welcomed into our Spirit Play classroom by a Door Keeper, who readies them for the lesson. The Story Teller leads the day's lesson and helps the children engage in the wondering questions about the story. Both the Door Keeper and the Story Teller assist the children during their independent expression time. In each session, children will hear a story and then experience a time for art expression relating to that story. The stories have a Unitarian Universalist focus and seek to build a UU identity through liturgical lessons pertaining to our central story, our covenant, our religious symbol the Flaming Chalice, our church history, and UU heroes. Many of our stories are about our Seven Principles, called Promises in this program, and our Six Sources. Others are about the mystery that some people call God. Children are welcomed into our K-1 classroom by a Door Keeper, who readies them for the lesson. The Story Teller leads the day's lesson and helps the children engage in the wondering questions about the story. Both the Door Keeper and the Story Teller assist the children during their independent expression time. We will hold a 6-week OWL class (specific dates: March 24, 31, April 28, May 5, 19) for K-1 children. Registration is required and the first class (March 24th) is a required orientation for both parents and their child. $100 fee requested (details below). OWL is a sexuality education program offered in Unitarian Universalist churches all over the country. It is a powerful program that helps our children develop a healthy understanding of themselves as sexual beings. The title "Our Whole Lives" was chosen in the belief that sexuality is a lifelong process of acquiring information and forming attitudes and values about identity and relationships, intimacy and health. We offer OWL to our children, and open it to the broader community, as a social justice initiative under-girded by values related to respect, relationship, and responsibility. Our Whole Lives teaches K-1 children accurate, developmentally appropriate information about birth, babies, bodies and families. Following a required Parent/Child Orientation on March 24th, the 5 remaining sessions engage children with stories, songs and activities. This class promotes dialogue between parent and child. The materials, books, and training are expensive and our RE program covers these expenses through fees paid by participants. Therefore, we request a $100 fee for this class. If this presents a hardship, please pay what you are able - we want every K-1 child to be able to attend. More information provided during the Parent Orientation. For more information about OWL: http://www.uua.org/re/owl. Contact Cynthia Westby, the Director of Religious Exploration at cynthia.drewsuu@comcast.net. The fall session will be six weeks: September 30, October 7, 14, 21, 28 and November 4. In the fall our 2nd-5th graders will be learning about environmental justice, nature observation, animal tracking and Plant for the Planet teachers will also be leading some of the sessions. In the winter 4th-5th graders will be participating in OWL or Our Whole Lives. If parents do not want to register their 4th-5th graders in OWL their children will participate in the 2nd-5th grade class. Both classes for Winter are described below. Second-Third Graders (and Fourth-Fifth graders who aren’t enrolled in OWL – see OWL details below) will be learning about other religions during the 8-week session (specific dates: January 6, 13, 27; February 3, 10, 24; March 3, 10). Second-Fifth Graders’ Spring session will last 6 weeks and continue the Winter exploration of other religions. Specific dates are: March 24 and 31, April 28, May 5 and 19, and June 2. We will hold an 8-week OWL class (specific dates: January 6, 13, 27; February 3, 10, 24; March 3, 10) for 4th-5th grade children. Registration is required and the first class (January 6th) is a required orientation for both parents and their child. $100 fee requested (details below). OWL is a sexuality education program offered in Unitarian Universalist churches all over the country. It is a powerful program that helps our children develop a healthy understanding of themselves as sexual beings. The title "Our Whole Lives" was chosen in the belief that sexuality is a lifelong process of acquiring information and forming attitudes and values about identity and relationships, intimacy and health. We offer OWL to our children, and open it to the broader community, as a social justice initiative undergirded by values related to respect, relationship, and responsibility. Our Whole Lives teaches 4th-5th graders comprehensive, developmentally appropriate introductions to key topics like values, body image, gender and sexual identity, peer pressure, and healthy relationships with sensitivity and inclusiveness, yet without specifically religious doctrine or reference. Following a required Parent/Child Orientation on January 6th, the 7 remaining sessions engage children with stories, songs and activities. This class promotes dialogue between parent and child. The materials, books, and training are expensive and our RE program covers these expenses through fees paid by participants. Therefore, we request a $100 fee for this class. If this presents a hardship, please pay what you are able - we want every 4th-5th grade child to be able to attend. More information provided during the Parent Orientation. For more information about OWL: http://www.uua.org/re/owl. Contact Cynthia Westby, the Director of Religious Exploration at cynthia.drewsuu@comcast.net. This UUA Reimagined curriculum uses select episodes of The Simpsons which tackle a diversity of social issues as the basis for in-depth discussions of a wide variety of social justice topics. At each class, an entire episode is viewed. After viewing, the class engages in discussion and activities, designed to encourage deep contemplation of issues. Students are quickly and deeply engaged in the topics, and become active participants in class discussions. In the Fall the episodes and conversations will focus on Environmental Justice. In the Winter and Spring the episodes and conversations will focus on a broad range of social justice issues. 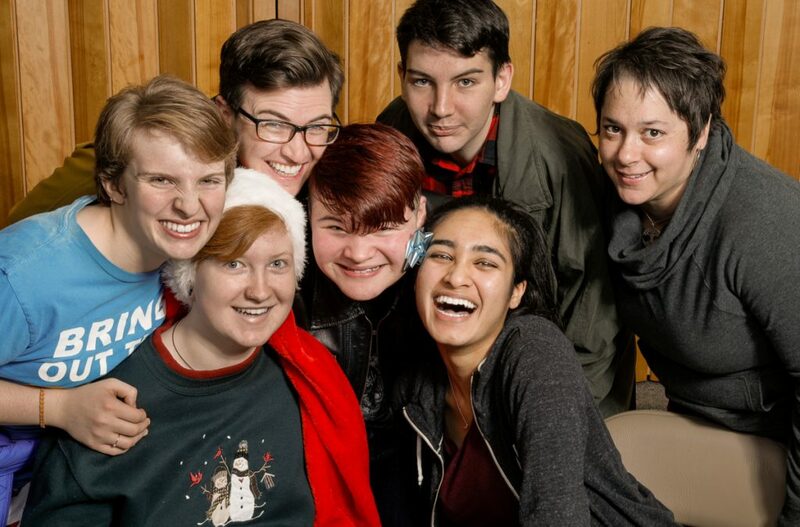 At Westside, high school youth are active in congregational life in many ways, including their Youth Group activities, acting as youth Chaplains, participating in committees and music groups, participating in worship, and working or volunteering in our RE program. Youth in Grades 9 through 12 are encouraged to worship with us in the Sanctuary on Sunday mornings. Youth also participate in retreats, weekend conferences, and leadership development opportunities throughout the year. To participate in off-site events, youth must be registered IN FULL and have special permission forms completed at the time of the event and be active in Religious Exploration activities so that the Director of Religious Exploration and the Lead Youth Advisor know who they are and can recommend them to the UUA Youth Con advisors and staff (the DRE and Lead Youth Advisor are required to make written recommendations attesting to knowing and supporting youth participation in UUA Cons and other activities). 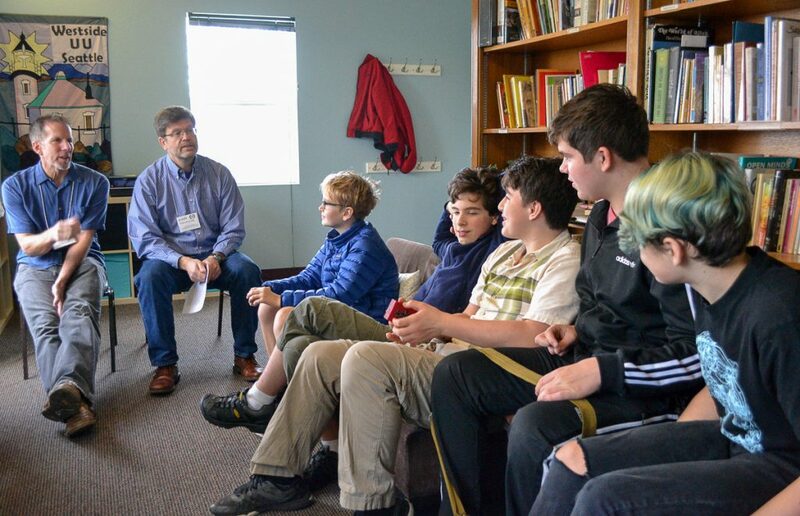 Discussion and experience are central to Youth Group as we explore our values and beliefs. Our program emphasizes learning, social action, worship, leadership, and community building. Each session includes opportunities for discussion, self-expression, and development of personal faith statements and spiritual practices. We also unpack our Seven Principles and learn how this covenant applies to our own lives. This group meets in the Youth Room from 7:00PM to 8:30PM on select Sunday evenings.